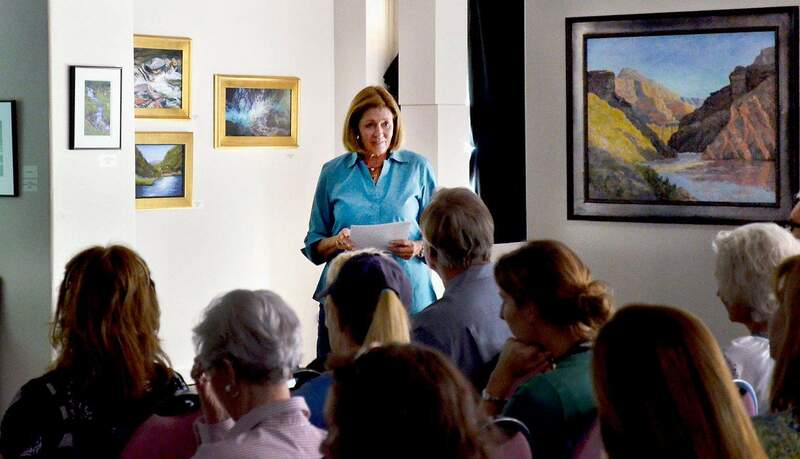 Veryl Goodnight brought the history of water in the west to life Saturday night with The Great American West  from Drought to Deluge. The Mancos artists lecture was one of several special events that will accompany the Water in the West exhibit at Durango Arts Center. There is a dry itch for water getting under the skin of farmers, outdoor enthusiasts and even artists across the West. Fires, barren crops and low running rivers are just the tip of the proverbial and, albeit quickly dissipating, iceberg when it comes to the drought seen throughout the country. 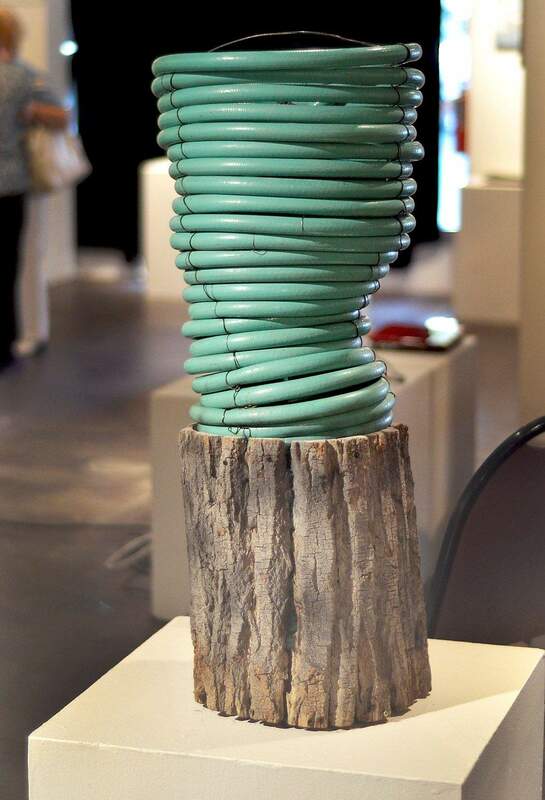 Perhaps it is serendipitous that Durango Arts Center is hosting an interdisciplinary series called Water in the West, a series of educational symposiums, talks with expert authors and a members-only art exhibit. Water in the West is a collaborative effort between Durangos Water Information Program and DAC designed to raise awareness about water conservation. WIP Coordinator Denise Rue-Pastin thought to bring the two disciplines together many years ago upon her arrival at the organization. Im hoping that (Water in the West) is just another avenue to raise peoples awareness of the value of water as a resource, and of the limitations and impending issues, Rue-Pastin said. The exhibit features work from nearly 70 DAC members. From paintings to sculpture to mixed media, the artwork is as varied as the all the forms of water itself. These artists have responded wonderfully to this theme, said Mary Puller, exhibits director at DAC. On Saturday night, celebrated bronze artist Veryl Goodnight spoke about the influence water, at good times and bad, has had on art since the days of the pioneers. Part history of the West, part retrospective of her own work, The Great American West  From Drought to Deluge gave a brief insight into Goodnights personal connection with water. Goodnights lecture will be followed by a presentation and discussion Aug. 24 with biologist and owner of Utahs Wild Rivers Expeditions, Kristen McKinnon and photographer Joaquin Salazar. Every one of these symposiums is going to be important. We have the opportunity, in our small way, to educate, Puller said. Water in the West also will feature a symposium with Colorado Supreme Court Justice Gregory Hobbs, Southwestern Water Conservation District Executive Director Bruce Whitehead, author Alice Outwater and archaeologist James Judge. Puller and Rue-Pastin also arranged a film presentation and book signing with former Sen. Gary Hart, author of Durango, a novel based on the Animas-La Plata water project. The DAC appearance will be his first book signing since its release. For Puller and Rue-Pastin, reaching new audiences through Water in the West was a key factor in developing the program. We were interested in reaching out to a different audience. A lot of times were kind of speaking to the choir, Rue-Pastin said. A 2004 UNICEF report found that more than one in six people worldwide dont have access to safe drinking water. With much of the country, not to mention the world, listed as a high water stress zone (meaning we use more water than we get), programs such as Water in the West are critical to beginning a discussion about this very real problem. People arent going to understand until they turn their water on and nothing comes out, Puller said. Hopefully, it wont come to that. Aug. 24  Blood, Sweat and Tears: Water on the Colorado Plateau by Kristen McKinnon of Wild Rivers Expeditions in Bluff, Utah and photographer Joaquin Salazar. Aug. 30  Water in the West, symposium with Colo. Supreme Court Justice Gregory Hobbs, Southwestern Water Conservation District executive director Bruce Whitehead, author Alice Outwater and archaeologist Jim Judge. Sept. 4  Water in the West: Perspectives from the River Community, film/discussion with local water advocate Kent Ford, Chuck Wanner of Trout Unlimited and Jay Loschert of Lower Dolores Boating Advocates. Sept. 10  An evening with former Sen. Gary Hart, author of Durango. For more information on the exhibit and events, visit www.durangoarts.org.